Left: the Holcomb Law Firm Teacher Professional Development Grant of $1,000 is awarded each year to a teacher who wants to take a college level course for professional development points or to pursue an advanced degree. 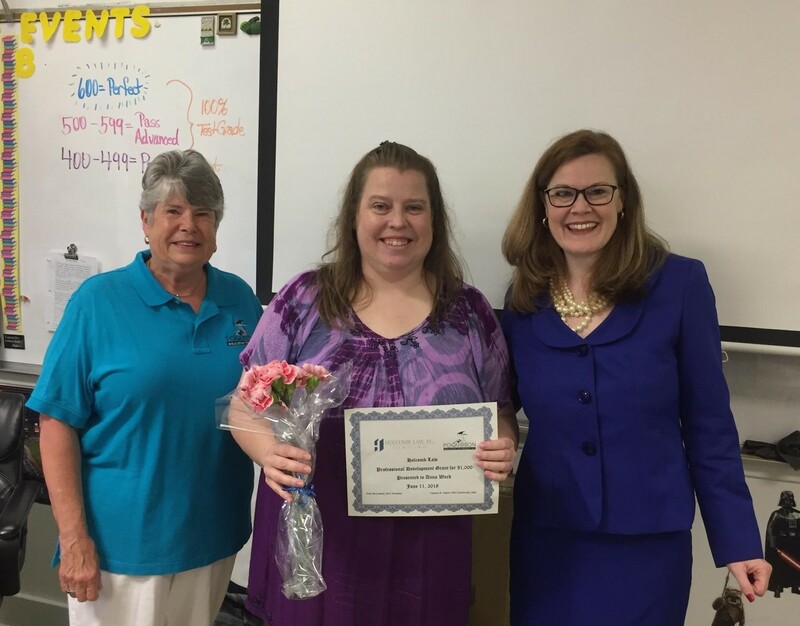 This year the grant was awarded to Anna Ward who teaches at PMS. Anna is purusing a PhD. Norm Remchuk proud of their hard work and dedication. This year seven PHS students and their coach traveled to Iowa State University to participate in Odyssey of the Mind World Finals. PEF awarded a grant of $1,750 to assist with travel expenses. PEF sponsors a semi-annual Teacher Grant Program open to all Poquoson teachers and/or teams of teachers at all grade levels. Teachers are invited to apply for either the Innovative Instructional Grant that awards up to $1,000 or the Instructional Grant, an award of up to $300. Instructional Grants help teachers develop, plan, implement and evaluate innovative and/or instructional strategies and classroom programs aligned with the Virginia Standards of Learning. Last year, PEF awarded $25,894 in classroom grants. 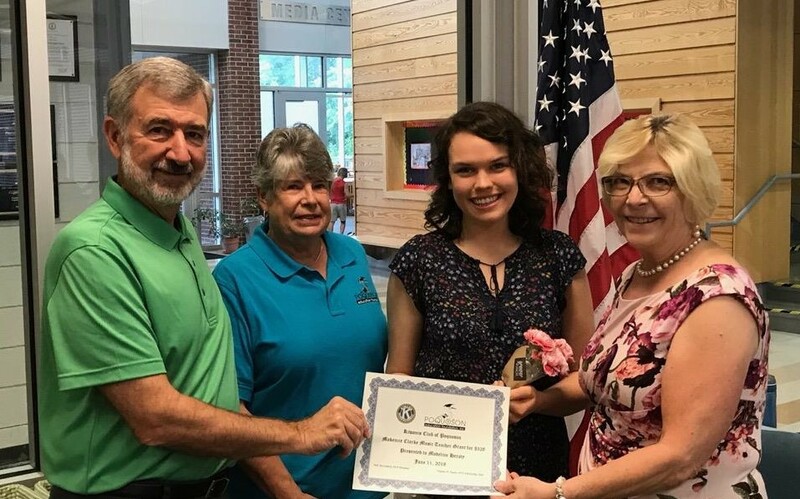 Right: The Mackenzie Clarke Music Grant is awarded each year to a teacher wishing to purchase materials to emphasize music in the classroom. Madeline Heraty, PES/PPS music teacher, was granted $328 for classroom materials. PEF is proud to support student organizations who represent PCPS in national or world competitions. Grants are awarded to help defray the cost of traveling to these events. 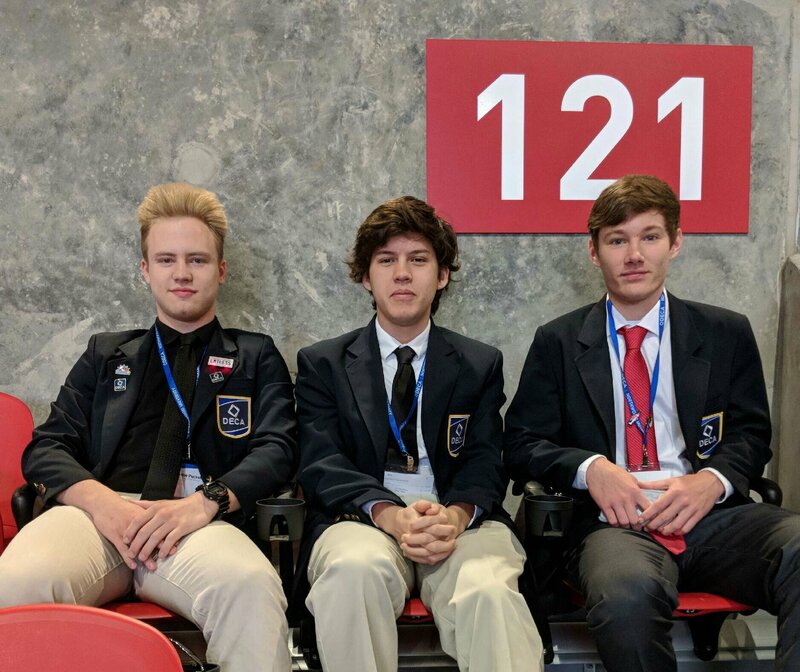 PHS Distributive Education Clubs of America (DECA) students under the direction of business teacher, Lisa Bowden, traveled to Atlanta, GA to participate in the International Career Conference. PEF granted a total of $750 to three students to help defray travel costs. PEF also awarded a grant of $1,000 to two PHS HUNCH students. HUNCH stands for High Schools United with NASA to Create Hardware. These students were selected to go to Johnson Space Center in Houston, Texas, as a result of their design and prototype that helps further the mission of NASA. The PHS Academic Challenge Team received a grant of $2,748.00 for nine students to travel to the national competition which was held in Chicago, IL. See how classroom grants impact classroom learning. Spring, 2019 applications are here!